(Click on the photo for a larger image). The Yellow-throated Warbler of Colonial Park continues to be viewed by many observers. The general location is either near Parking Lots A, B or somewhere in between. A PDF of the park map can be seen at this link. You can view Bill’s other photos at the following link: Bill Dix’s photos on Picasa. A Glossy Ibis was seen at the Denville Fields (Tim Vogel), which is labeled as McCarter Park on Google maps. This is the fourth separate Glossy Ibis report for Morris County this spring. The Little Blue Heron and 2 Blue-winged Teal remain at Loantaka Brook Reservation (m. obs.). An American Bittern was spotted at the Friends Blind of the Great Swamp NWR Wildlife Observation Center. The Great Swamp also had Blue-winged Teal, 2 Northern Shovelers, 8 Green-winged Teal, Hooded Merganser, Purple Martins, etc. (Simon Lane). 63 Ruddy Ducks and 22 Buffleheads are at Mt. Hope Lake (J. Klizas). 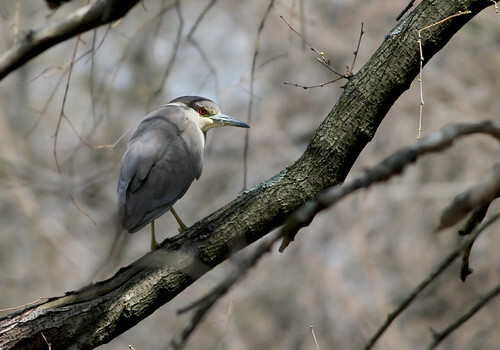 Below is a photo of one of the Black-crowned Night-Herons frequenting Green Brook Park area in North Plainfield.